I’ve mentioned before that for a short while from around late 1985 for maybe around 18 months that music took a bit of a back-seat in my life. I had just graduated from university, gotten my first job and moved to Edinburgh to live. I got a bit entrenched for a while in the world of community theatre and even a bit of stand-up comedy…..writing stuff for others not performing. So there’s a bit of a hole in the collection from around this era. I’m aware of a fair bit of the stuff thanks in the main to Jacques the Kipper and his endless supply of compilation tapes a few years later, many of which featured songs and bands from my ‘lost’ period. Today’s Scottish singles isn’t one that JtK brought to my attention. 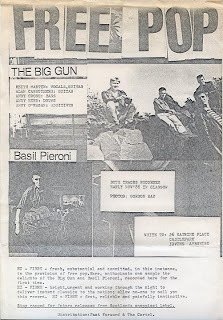 It was only in recent years through the blogging activities did I learn that a number of excellent yet short-lived Scottish bands embraced the DIY ethos much of which would contribute to the C86 movement that totally passed me by at the time. History doesn’t say record much about The Big Gun. They were from Irvine, a town on the west coast of Scotland some 25 miles south-west of Glasgow. 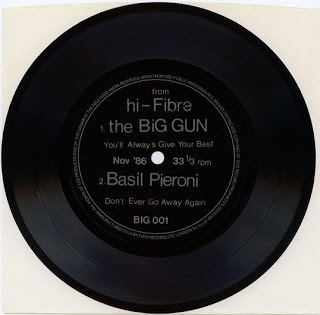 They only ever released one single on their own Hi-Fibre label while one other song was made available via a flexi-disc which had, on the other side, a song by another native of Irvine, a singer-songwriter called Basil Pieroni. 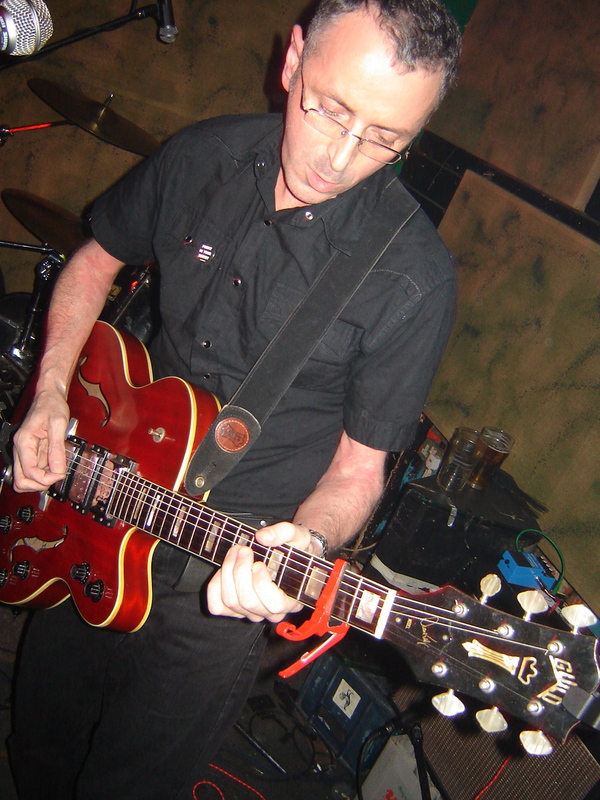 Have a listen folks…..and discover one of THE great long-lost 45s of Scottish indie-pop. Oh and the chap Andy O’Hagen on “additives”? ?